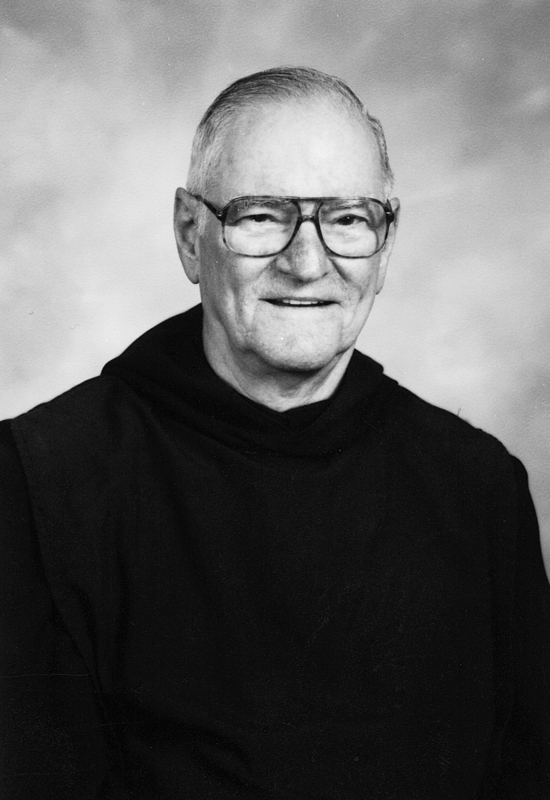 Father Paul Miranne, O.S.B., died peacefully at Saint Joseph Abbey on 30 March. He was 94 years old, the senior in his community and the longest-lived monk in the history of his monastery. He was in the 75th year of his monastic profession and the 70th year of his priesthood. Donald Miranne was born in New Orleans on 5 July 1922, son of Alfred C. Miranne, Sr., and Irene Pasley Miranne. He was preceded in death by his parents (his mother lived to the age of 102) and by his brother Alfred C. Miranne, Jr., and his sisters Irene Miranne Stokes and Muriel Miranne Fitzwilliam. Donald studied in the high school and junior college of Saint Joseph Seminary, graduating in 1941. He entered the Benedictine monastery of Saint Joseph Abbey that year, and he made vows as a monk on 20 August 1942, when he received the name Paul. He was ordained a priest on 7 June 1947. Father Paul was charged with the upkeep and maintenance of the abbey and seminary buildings for 33 years, from 1950 to 1983. He taught mathematics, Latin, civics and chant in the high school division of Saint Joseph Seminary from 1950 to 1964. He was also vice-rector of the seminary and one of its prefects of discipline. That title suited him perfectly: he was a stern disciplinarian and taskmaster, with a basilisk stare and the uncanny ability to materialize just when furtive infractions had reached the point of no return. Generations of seminarians and priests looked up to him as a cherished mentor, whose terse castigations – more stinging than any lash – they could appreciate better after they graduated, and a rich treasury of his rebukes is a staple whenever alumni gather. In 1964, he was appointed prior of the monastery, and he served in that office until 1969. He also served for many years as a member of the abbot's council. From 1983 to 1998 he was manager and general handyman at Camp Abbey, the summer camp the monastery ran in conjunction with the Knights of Columbus for boys and girls. He felt particularly close to the counselors and staff of the girls' camp, who were more gentle than the boys on buildings and equipment, and he basked contentedly in their affection. He assisted on weekends in various parishes in the metropolitan area, notably at Saint Philip Neri in Metairie. In his later years, when he could no longer drive, Saint Philip parishoners would sign up months ahead of time to pick him up on Saturday and bring him back to the monastery on Sunday afternoon. The congregation looked forward to the jokes with which he began each homily – often rendered unintelligible by his inability to resist laughing his way through the punchline. Father Paul was a lover of simple things. He was the cheerful landlord to a flock of purple martins, whose house he carefully readied each year for their return from Brazil in February. A true Louisianian, he knew no bliss greater than sitting before a mound of boiled shellfish; he could accurately predict the amount of pleasure to be gotten from a boiled crab by a quick glance at the underside of its shell. The monks of Saint Joseph Abbey will receive their departed brother before Vespers at 5:30 pm on Wednesday 5 April. A Funeral Vigil will be held at 7:15 pm that night. The Mass of Christian Burial will be celebrated at 11:15 am on Thursday 6 April. Donations to the Saint Joseph Abbey and Seminary Flood Relief Fund preferred in place of flowers.